General Brian Peddle has now taken office as The Salvation Army’s 21st international leader, succeeding General André Cox, who has retired. He is joined in leading the global Salvation Army by Commissioner Rosalie Peddle (World President of Women’s Ministries). Commissioner Peddle received a BA in Biblical and Theological Studies in October 2007 from the William and Catherine Booth Bible College in Winnipeg, Canada. 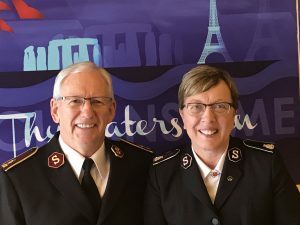 Both the General and Commissioner Peddle are graduates of The Salvation Army’s Executive Leadership Program from Simon Fraser University in Canada. Fueled by their conviction that God continues to use The Salvation Army to impact our world, the General and Commissioner Peddle share a strong sense of calling as Salvation Army officers. They are convinced of their responsibility to preach the gospel, encourage the saints and serve those in need. They fully embrace and celebrate the diversity of The Salvation Army, while sensing deeply the joy of leading an international Army that is unified through its calling to mission.